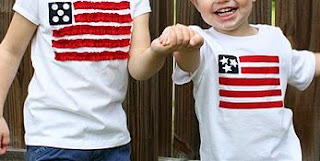 Here are just a few quick ideas to sew to get you ready for the 4th of July. Materials: red t-shirt, white T-shirt, sewing machine, thread, pins, 5 white buttons, and blue fabric square. Cut up an old red t-shirt and made strips out of the knit that was 1/2 x 12 inches. Make the flag (about 6 1/2 inches wide) and placed pins at each side. Lay the strips down and let the tails hang over the right side for now. Make a pencil mark at the left side of each strip and the right side of each strip, 1/4 inch down from the top of the strip (so the line would be centered down the center of each strip). And then make a straight line with a pencil. Make a basting stitch down the center of each 13 inch strips and gather them so that they are only 6 1/2 inches wide (because that’s how wide my flag is). Pin each ruffle in place, directly over top each pencil mark. (And I ended up trimming about 2 inches off the ends of the top two ruffles because they were more ruffly from being gathered more to fit a smaller space. Sew each ruffle in place. Cut a blue knit square (again, from an old t-shirt scrap) and sewed it right to the shirt. Then sew five little buttons onto the square. First, iron on Heat ‘n Bond to the big chunk of the red knit. Cut strips of red that was 1/2 x 6 inches. Peeled off all of the paper backing. Then and lay each strip on the front of the shirt. Added some Heat ‘n Bond iron on adhesive to a little blue square as well, and placed everything just where want it. Traced some stars onto the paper backing of the adhesive, cut them out, and then added them to the blue square. Iron everything in place. Stitch around everything. To make the flower, lay out about 12" of the wider Ric-rac. Using Fabric Fusion, glue on a strip of thinner Ric-rac on top of wider version. Let dry. Using needle and thread sew a running stitch through both layers of ric-rac. Pull on thread until Ric-rac bunches up. Pinch the bunch into a circle so that the bumps look like flower petals, and sew into place. 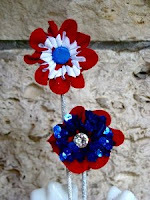 Hand sew or use hot glue to attach a button center to your Ric-rac flower. Set aside. To create the stem, cover a pointy stick (I used kabob skewers) with a layer or two of white paint. While it's still wet, completely cover the stick with glitter. Let dry. Hot glue stem onto back of flower. Sewn onto a little girls' dress. Turned into a jacket brooch, by adding a pin to the back. Glued onto card-stock for 3-dimensional cards. Sewn to a long piece of ribbon and tied onto a present.